Mother's Day at T.J.Maxx and a $25 T.J. Maxx Gift Card Giveaway! Mother’s Day is coming up! I know I can’t wait. If you are looking for some great styles, now is the time to check out T.J. Maxx! Make this Mother’s Day the best one yet by showering her with all the finest gifts. Whether she is a first-time mom or even a grandmother, gift her with high-quality, on-trend designer merchandise without breaking the bank. 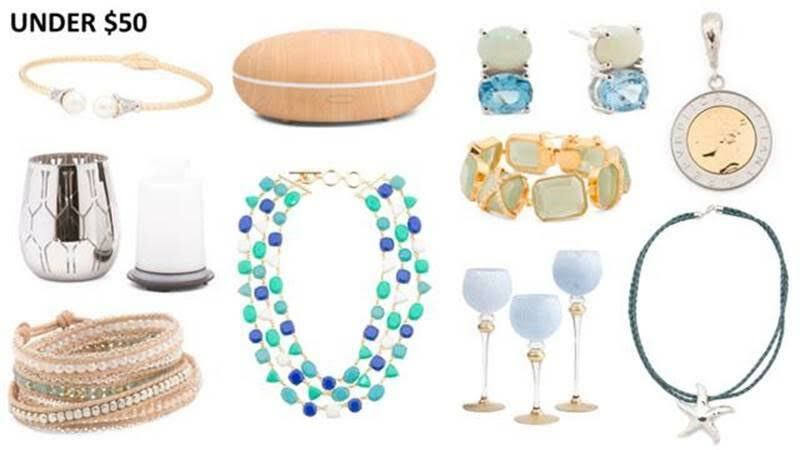 Head over to the Mother’s Day Shop at TJMaxx.com for wow-worthy gifts at every price point! 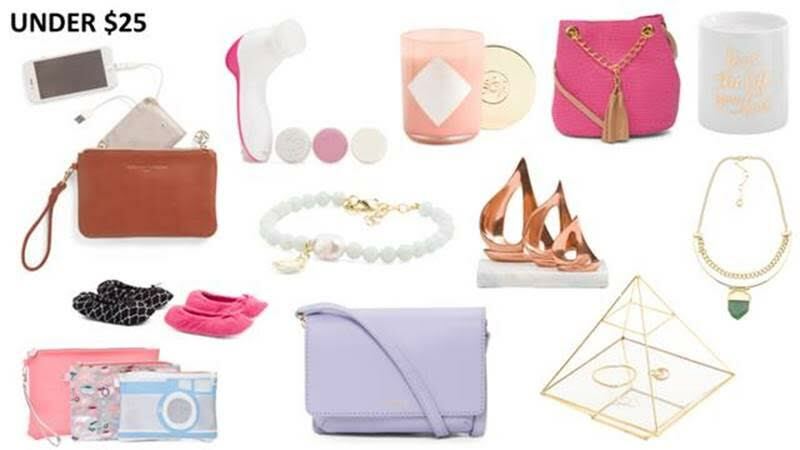 From Italian leather handbags and fine jewelry to scented candles and spa essentials, TJMaxx.com is your one-stop shop this Mother’s Day. GIVEAWAY: One winner will receive a $25 Gift Card to T.J. Maxx. All my opinions are my own and not swayed by outside sources. For this giveaway simply check out the Mother’s Day items at T.J. Maxx and tell me your favorites in the comment section proceeding this post. While the other entries are optional, I highly suggest filling them out to increase your chances of winning. US only. Good luck! Staples Tax Reward Sweepstakes- Enter to get your taxes paid for when you in-store shop! My favorite item is the Stephen Webster 18k White Gold Turquoise Doublet Ring. I would love mid sleep gown. It is awesome. I really want a facial brush like the Clarisonic! I love the Gucci Made In Italy Luxury Sunglasses. The DIANE VON FURSTENBERG 28in Trunk Style Hard Case Luggage would make a nice gift. My favorite is the YANKEE CANDLE Himalayan Air 2 Wick Jar Candle. I love the Italian leather handbags. I love bags in general and this looks wonderful. I like the Ligero Leather Ninja Satchel. My favorite item is the MARC BY MARC JACOBS Classic Q Zip Around Leather Wallet. My favorite is the Ligero Ninja Leather Satchel. I would like the KIPLING Johanna Tote. I like the LEFLEURIA, 4pc Energizing Wellness Oil Set. I really love the Ligero Leather Ninja Satchel! I need a new purse. The shortie set – or the oils would be my faves! 🙂 Thank you! No way I could just pick one thing! I do especially love the Gold circle necklace though! I really like their ENCHANTE 11×14 Shabby Matted Portrait Frame. It seems I never have enough frames! My favorite is this super cute NICOLE MILLER NEW YORK Lace Shortie Set! I like CELINEMade In Italy Medium Trio Leather Crossbody. I like the 11×14 Shabby Matted Portrait Frame. I love the SABELLA M Sterling Silver Cubic Zirconia Elephant Necklace! 5-in-1 Electronic Manicure & Pedicure Tool. i like the solid cuff pants. They look very sift ad comfortable. The Holistic Floral Set and the 4-pc Energizing Wellness Oil Set. My favorite item is definitely the ORO LEONI 14k White Gold Diamond Station Necklace! I really want the CLARISONIC Mia Fit Facial Brush Set!! My favorite item is the FILA Lightweight Mesh Running Sneakers. I could use a good pair of running shoes and these are stylish as well. I like their PORTOLA Structured Satchel in black. The Anne Klein Midi Night Dress is my favorite. The CYNTHIA ROWLEY Sleeveless Shorty Pajama Set is one of my favorite things on the T J Maxx web sight. i love the URBAN TRENDS Ceramic Hand Jewelry Holder. Women’s Swiss Made Diamond Marker Watch. Loving the 3 piece blue candles and all the purses! I like the Clarisonic Facial Cleansing System. For a women i will tips you a one thing after your pregnancy. Your baby will be safe. When you are carrying your baby from anywhere a stroller will be very helpful that times for carrying your baby. The midi Sleep Gown looks cute and comfy! The Striped Tassel Tote! Thanks for the chance to win! I like the GURUNANDA Honeycomb Diffuser With Oils. My favorite item is the little lavender purse. I also love to shop at TJ Maxx. So many lovely things! I want to buy something for all of the wonderful mothers I know. They have so many great items but I usually get my workout clothes there. I love them. I like the CLARISONIC Mia 1 Facial Sonic Cleansing System. I like the DAY AND MOOD Mimosa Leather Tote bag. I love the LA PERLA Lace Fantasy Babydoll Chemise! PROENZA SCHOULER Made In Italy Medium Hava Leather Bag. 5×7 Top Knot Rope Frame. Thanks. I love the MIA FIORE Rose Plate Silver Origami Swan Necklace. Women’s Swiss Made Intreccio Topaz Charm Leather Strap Watch. I would love to get the Michael Kors Tote in time for Summer!! Thank you for the opportunity to enter! My favorite item is the Clarisonic for facial care. I like the PROVENCE BEAUTY Repair Facial Oil. My favorite item is the super expensive DOLCE & GABBANA red leather backpack!!! I really like many items but could use the Sheep Sleep Pants. I love the Sheep Sleep Joggers. They are so stinkin’ cute! I like the Too Hot To Handle Leather Satchel. I would love to have the SPAROOM Aeromist Ultrasonic Diffuser. I would love the CLARISONIC Alpha Fit Sonic Cleansing System. My favorite is the Dolce & Gabanna Padlock Flap Grained Leather Bag. I like the Anne Klein striped nightshirt. I was a beautiful COMME DES GARCONS Made In Spain Leather Zip Wallet. The shade of blue is gorgeous! From the above picture, though, I do really like that lavender leather handbag bottom center. Beautiful color invokes spring. I like the shortie set the most. I love the PORTOLA Structured Satchel! I like the Anne Klein striped night shirt. The LOUISE ET CIE Crystal Drop Earrings would be a lovely gift! I like the KENSIE Short Sleeve Jogger Pajama Set! I like the New Q Percy Leather Crossbody purse. Made In Italy Sasha Star Leather Tote, THIS BAG IS GORGEOUS!!! I like the MIA FIORE Made In Italy 14k Gold Paw Cutout Heart Necklace. I like the KENSIE Koala Lace Trim Top Jogger PJ Set. My favorite is the pink MAGID Straw Crossbody With Tassels. I really like the Medium Trio Leather Crossbody Bag. I love the Gucci Made In Italy Luxury Sunglasses. Classy looking. Spas Of Thailand 2 Wick Jar Candle. I like the PORTOLA Structured Satchel that sells for $29.99. Nars matte lipstick are a wonderful product. The MIA Fiore paw print necklace. I really like everything but I like the shoes that they have too,. My favorite item is the KENSIE short sleeve jogger pajama set. The LODIS RFID Protection Leather Clutch Wallet is my favorite! The grapefruit candle set or the Ahava set- I love buying that kind of thing at TJ Maxx. I really like the MAGID crossbody purse! The TODS Mini Double T Leather Crossbody is cute! My wife likes the Turmeric Facial Repair Serum. I think I like the Sentry 38 Leather Strap Watch the best. I love the Marilyn Monroe Microfiber Sleep Set!It looks comfy. It’s expensive, but I love the NOTTE BY MARCHESA Lace Cocktail Dress. It makes me want to host a cocktail party even more. I like the Mia 1 facial sonic cleansing system. I like The Cream Shop brush a lot. It looks like a quality product. The Oro Leoni 14k gold diamond band ring is one of my favorite items. I like the KENSIENightwalk Paisley Pajama Set. Strappy Shorty Pajama Set is nice. OOOOOH, I love the MAGID Lobster Canvas Tote, a great maritime theme! Thanks for the awesome giveaway opportunity! I like the JONES NEW YORK Laser Cut Wristlet! I like the, COLE HAAN By The Sea Anchor Necklace. I like the GURUDEVA Made In India 14k Gold Plate Labradorite Cuff Bracelet. made in Italy 14 k gold love knot necklace. I really like the swing tank Pajama Set. I like their Take A Nap Sleep Shirt. So funny! The Dune & Willow ombre tassel necklace is really pretty! Love how carefree it looks. I really like the DAY AND MOOD Mimosa Leather Tote. Would be perfect to fit all mine and the kids extra stuff they think mom needs to carry for them whenever we leave the house. I love the PORTOLA Oversize Hobo bag. I love the GURUDEVA Made In India 14k Gold Plate Blue Chalcedony Open Bracelet! I wll ight away seize ykur rsss as I caan not too fund yoour eail subsciption link oor newsletter service. ggo long with your views oon thiis website. I cluld not resist commenting. 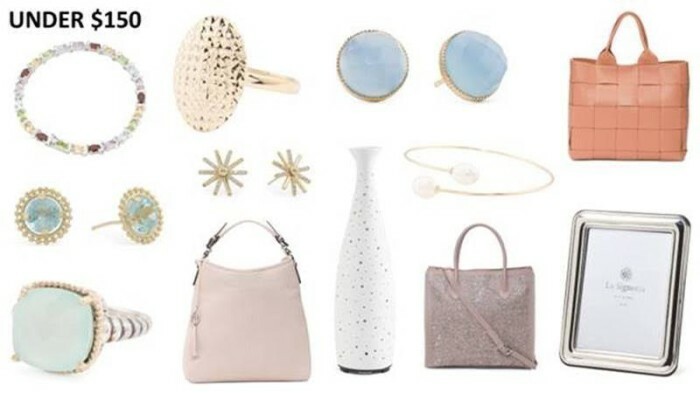 Love those items – 18k White Gold Turquoise Doublet Ring, 14 k gold love knot necklace, pink duffle purse, solid cuff pants etc. most of are lovable items. Wow! Their online selection has really grown! My mom would love the MARC BY MARC JACOBS Petal To The Metal Leather Wallet. I’d flip for the FENDI RFID Monster Tote! i love the Hot to handle leather wallet in black! I like the Teocalli silver necklace. Made In India 14k Gold Plate Moonstone Cuff Bracelet- This is super cute! My favorite is the GURUNANDA Globe Diffuser With 2 Oils, it’s a great gif t idea. I like the KENZO California Small Leather Satchel in silver. My favorite item is the MAGID Straw Crossbody with Tassels. It’s so cute and perfect for the summertime! I love the Givenchy bag, so cute! I would love to receive the ORO LEONI 14k Gold Diamond Band Ring as a gift. The portolo oversized hobo is so cute! love the Gucci Made In Italy Luxury Sunglasses. I like the Portola structured satchel. I love the MARC JACOBS Women’s Courtney Petite Leather Strap Watch! I really like the maxi sleep dress. Looks so comfy. I like the Yankee candle. Made in Italy Mini Leather Backpack. I like the hanging travel bag. I like the Portola satchel. I really like the Stephen Webster 18k White Gold Turquoise Doublet Ring, or the Clarisonic facila cleaning brush. My favorite is the Structured Satchel. I love the Kipling tote! I think the Ahna pajama set is cute. Thanks for the chance to win. My favorite item would be the Perforated Flat Suede Espadrilles, they would look so good with my sundresses. I like the KIPLING Johanna Tote. I would like DUNE LONDON Small Convertible Satchel. The In Bloom lace tank and shorts pajama set is really cute! The tee and cinched shorty pajama set is my favorite. I like the Natori Shangri Pajama set. Since I’m in the market for a black purse, I’d say the Portola satchel. My favorite product that I’d like to have is the FIRST NATURAL 10ml 3pk Rise And Shine Essential Oil Set. The LUCY & LAUREL Pineapple Strappy Shorty Pajama Set is my favorite. My favorite is the Macbeth Quilted Jumbo Domed Cosmetic Bag. my favorite item is the Perforated Flat Suede Espadrilles they are adorable. My favorite item is the Charcoal & Neroli Face Scrub. I love the HALSTON HERITAGE Embellished Ankle Pants! I love the portola structured satchel. My favorite item is the Made In Italy Jiji Chain Small Leather Shoulder Bag. Collage Print Pajama Set. Very nice! I love getting clothes there. I love the ORO LEONI 14k Gold Diamond Band Ring it is so pretty. I love the CONCETTA IOVANNI Made In Italy Rose Gold Plated Silver Popcorn Knot Bracelet. I also love the deals they have on kids clothes. I have bought several outfits for my kids from TJ Maxx. My favorite is the Gucci sunglasses made in Italy. I love the Yankee Candle!! I like the GUCCI Made In Italy Luxury Sunglasses. I like the the Stephen Webster 18k White Gold Turquoise Doublet Ring. Men’s Black Stainless Steel Band Ring! The Oro Leoni 14k Rose Gold Morganite And Diamonds Emerald Cut Ring is my favorite. I really like the Portola satchel. I like the BORGHESE Cool Eyeshadow Palette. I like the Italian luxury sunglasses. I love the Ink + Ivy printed pajama set. Queen of everything bath set. Short Sleeve Sleep Shirt in Grape. I absolutely love the starfish necklace! I love the Fila lightweight sneakers! I love the Portola bag! Ive always loved the selection of purses at TJ Maxx! My favorite is the PORTOLA Structured Satchel. I love the bathrobe and candles. I love the MARC BY MARC JACOBS Ligero Leather Ninja Satchel! I love the sunglasses! Thanks for the chance. and it is made in India. It is beautiful. It would go with so many of my outifts! I like the roll on oils! Begonia Nightgown. This looks so comfortable and stylish at the same time. I like the DONNA DIXON Oversized Riley Canvas Beach Tote. I like the 14k Rose Gold Morganite And Diamonds Round Ring. I have glaucoma, and the Beauty Concept Eye Masks look like the perfect solution for eye pain. Thnaks for a great giveaway! I like the AMERICAN REPUBLIC Raleigh Slub Jersey Henley the most of all of the fine items at T.J. Maxx. I love the Serpentine Leather Hobo! Thanks for the chance!